In my adult life I’ve been involved in eight total car transactions. 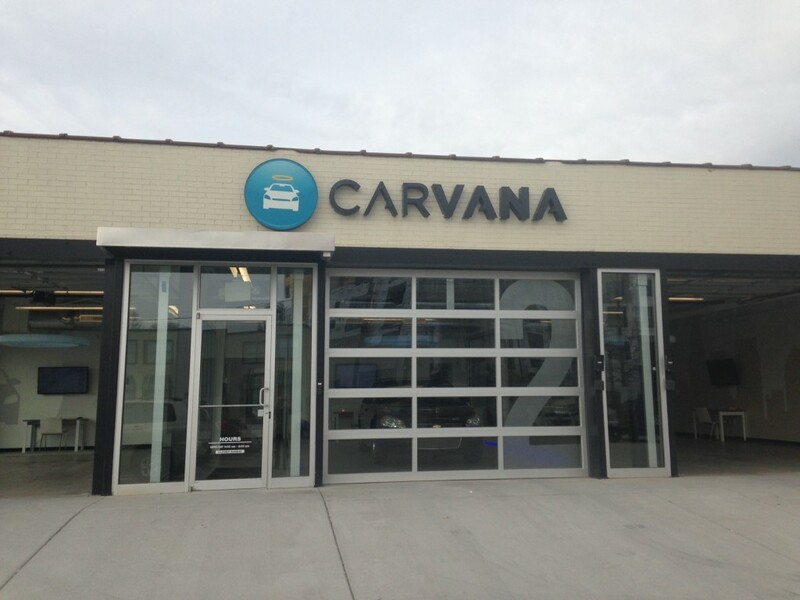 In all those transactions – both buying and selling privately and at a dealership – I’ve never had an experience like the one I’m about to share in this Carvana review. This 2-year old company based in Atlanta may be revolutionizing how used cars are bought and sold. You may have heard about Carvana from their “lazy man” Super Bowl ad spot. I first ran across their name while shopping for a used Suburban. I did what a lot of consumers do when they see an unfamiliar name the first time – I ignored it and looked away. But their name surfaced again in an advertisement when my wife and I were doing a private sale of my Toyota Tundra. We had run into some headwinds (i.e. no one was interested) in our initial attempts using Craigslist and were looking for other options to move our truck. So she decided to check out Carvana and see if selling them our truck might be an option. Here’s what we learned about the company…and eventually experienced first hand. Founded in 2013, Carvana is best described as a 100% online used car-buying company. There are no dealerships. No physical showrooms or salesmen. And no negotiations. And because their inventory is entirely online, you can shop 24 hours a day – whenever it’s convenient for you. You may like it already. Your first step is to search through the Carvana inventory. As you search they allow you to create a “virtual garage” to store all the cars in which you might be interested. They give you a 360-degree virtual tour of the interior and exterior of each car in their inventory and point out in detail all the blemishes on the vehicle. Once you find a car to your liking, simply review and sign the contract online. There are financing options through Carvana should you need that. Once you have signed the contract, select your deliver date and time (or schedule to pick the car up in person at what they call “the vending machine”). Three cars in the vending machine, ready for pickup. That’s it…really! Only three steps needed to buy a car. 1. Most of their inventory is no older than five years. 3. Carvana offers next day, free delivery to your home within a 75-mile radius of their local service area (which right now is Atlanta, GA, Nashville, TN and Charlotte, NC. 5. They don’t sell cars with an accident history. 6. All cars are certified by Carvana. Each vehicle goes through a 150 point mechanical and safety inspection. They also do a complete premium detail. 7. They’ve partnered with Experian to provide a free Auto Check History Report. 8. Each car comes with a 100-day, 4,189-mile guarantee (based on statistics that say the average person drives 41.89 miles per day). Now you may be as skeptical as I was. I mean the car buying process is a very personal one. Don’t you need to see the car and get behind the wheel to really make a good decision before buying? Well, Carvana has thought of that. A Carvana delivery truck leaving with a purchased vehicle. What really makes this process work is that Carvana offers a 7-Day, No Questions Asked Money Back Guarantee. You get to keep the car for a week, drive it around your neighborhood, let family and friends look at it and then decide if you want to keep it. Don’t like the cup holders? Dissatisfied with the get up and go? Having second thoughts about the color? Take it back. There will be no arm-twisting to persuade you to keep it. The second thing that makes Carvana work is simply their business model. By cutting out the dealership overhead and the hidden fees that are typically associated with buying a car, they are able to sell their cars at a cheaper price…typically $1,500 -$2,000 cheaper. They pass the savings on to the consumer…and what consumer doesn’t like that? So my wife and I were approaching this from a seller’s standpoint. 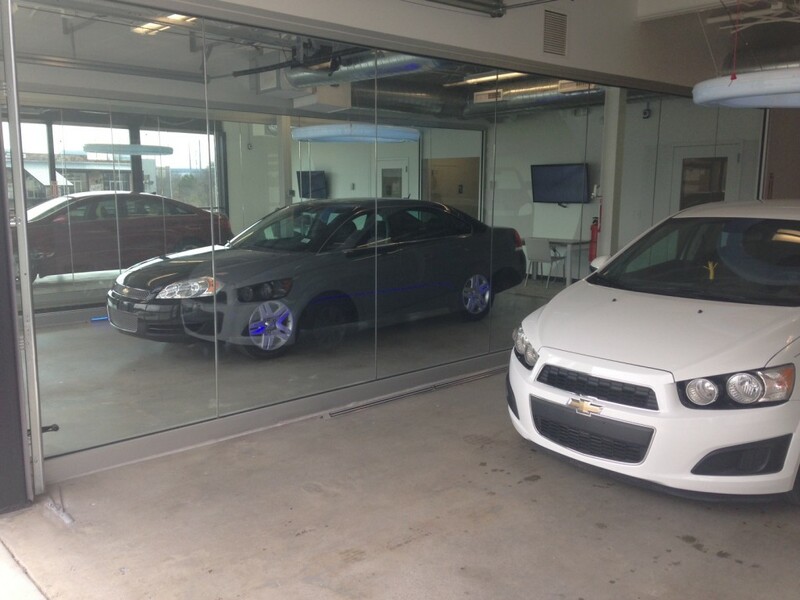 Carvana also accepts trades and buys cars from the public. But the experience is much the same. We went to the Carvana-Trades webpage and entered the vehicle VIN number. They proceeded to ask some basic details about the truck. This step involved giving them information about the color, transmission, number of doors, mileage, license plate number and state where the vehicle is located. Has the vehicle been in an accident? Has the vehicle sustained any frame/structural damage? Does our car have mechanical defects? Has the vehicle ever been smoked in? Are there two sets of keys for the vehicle? Do you have an active loan on this vehicle? After this we created an official account with Carvana and gave them our contact information. We were told a representative would contact us within 24 hours with an offer for the truck. They got back to us within 8 hours with an offer that was valid for 7 days. To our surprise it was exactly what we were asking for the truck – right around what Kelly Blue Book said it was worth for a private sale. We called an accepted the offer. Now it was off to the vending machine in Atlanta for my drop off. The morning I went to drop off the truck I was nervous the whole trip downtown. 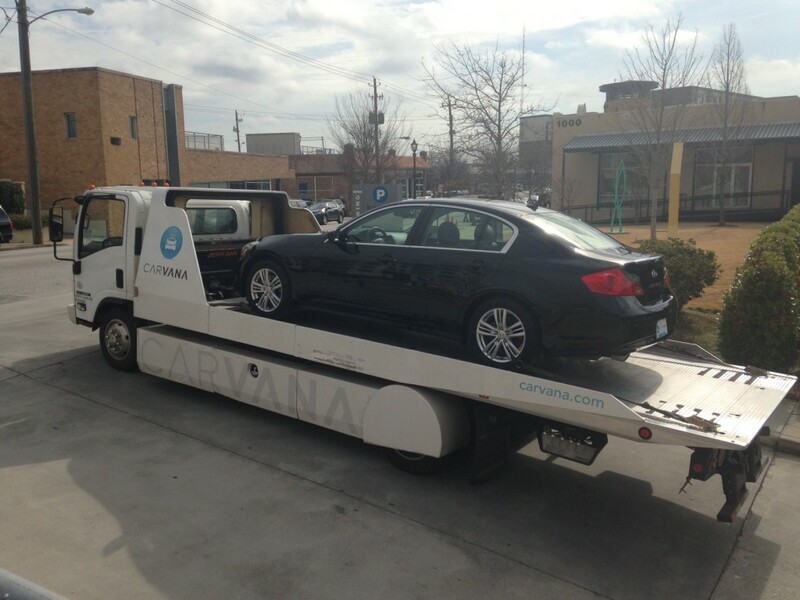 The experience with Carvana had so far been like none I’ve every experienced before. Buying and selling a car can’t be this easy. I’m on full alert just waiting for something to fall through. I’ve got what seems like a great offer in hand but I KNOW they are going to try and talk me down once I get there. I mean this is a 9-year old truck. It’s in great shape with low miles but the leather is a bit worn in spots and it has the typical scratches and scuffs you’d expect from a truck that age. I’m fully expecting to walk away with less than they offered me online. I mean isn’t that what you’d think from your history with car dealerships? A friendly staff greeted me upon arrival and in just a few minutes had pulled up my paperwork. The manager took my truck on a five-minute test drive to make sure it ran properly. When he returned we signed some paperwork allowing them to take control of the vehicle and I signed over the title. Then he handed me a check for exactly what they had offered. I know you want some juicy details…like that moment where I put my foot down and threaten to walk out the door. There really aren’t any. I didn’t leave anything out. It went that quick. The whole ho-hum transaction took less than 30 minutes. I was so impressed though I spent the next 30 minutes talking with them and learning about the company. That in itself – that a manager would take the time to discuss the details of their company with an average Joe – should tell you a lot about the company’s values. In all, I’d rate my experience with Carvana an A+, 100% positive. I’m not alone. Per the date of this writing, of the 645 reviews listed on their site (that are unfiltered and managed by a third-party company) only 5 were rated as 3 stars or less. That’s a solid track record of positive customer service. This is still a fledgling company with only three local markets and a fourth (Dallas) on the way soon according to what I was told. However, they are experiencing tremendous growth. The manager mentioned that in February of 2014 they sold around 40 cars. Last month – in February of 2015 – they sold over 500. That’s pretty solid year-over-year growth wouldn’t you say? The online car buying experience won’t be for everyone. Others though are seeing Carvana as nirvana for their used car buying soul. If the company continues to focus on customer service and the business end is managed properly, I can see Carvana breaking down the barriers and hesitancy people have from buying a car sight unseen. If that happens they will alter the landscape of the used car buying industry. Who knows? You might just be seeing one pop up in your local or regional market in the next few years. Questions: Have you ever bought a car online? Would you be more likely to buy online if you had a no-hassle, 7-day money back guarantee and the car could be delivered to your door? What else would you like to know that I didn’t mention in the Carvana review? Wow sounds like a great experience. I don’t live anywhere near their locations. I’ve bought two cars in my life – one at a tiny dealership when I was 16 and a large dealership when I was 21. There was definitely some bait and switch tactics at the large dealership but I was too young and dumb to realize. Seems like what you are describing would be a problem with any used car, whether purchased online or at a dealership…No? Thanks for sharing this post. I have bought my first car and I was very happy. The car is BMW and it is awesome. don’t trust the financing with carvana I was looking for a new Honda CRV and found several of interest so I thought I would try the financing and to my amazement they wanted to stick me with an 18% interest rate. My credit score is 727 so I drove down to my local Honda dealer and applied for Honda Finance and got 1.9% ( big difference ) don’t let this company rid you off. So I was in a car accident after Hurricane Harvey, and I have been waiting for two weeks for the check for my totaled out 2012 Ford Fusion. I figured if I had the money in hand I can go to the dealership with a negotiation tool. A very good friend of mine mentioned Carvana and I had completely forgotten about them since they are fairly new here in Houston, TX. Well I went on the website and they did a soft credit inquiry and let me know exactly what I qualified for. To my surprise with my credit score which isn’t horrible but could use some work, I was able to qualify for cars at no money down. So I picked the EXACT car I wanted from the inventory. Went through the process COMPLETELY ON LINE. And had an OH SNAP moment when I realized I did some real adulting and bought the car I wanted, with the financing I wanted (did not want to finance past 4 years) and I get to keep the check for my other car in my savings account. The car I chose that I now loving call Fernando the Fusion is the newer version of the car that was totaled by someone without insurance and not paying attention. I opted to pick the car up and check this out. I did all of this this morning!!!! So I am now totally spoiled and if I feel a need to buy another car, I am going through carvana. I mean I eSigned the documents to my car! It is literally mine! Well it will be on Monday when I pick it up. Great review Brian….It was so great that I began to wonder what was in it for you. That’s neither here nor there. However, I am intrigued by the response that Sandy got when posting something negative. Hmmmm, maybe her issues surfaced beyond 7 days. Her experience is what it was and her comment post is her right….to have it demeaned because its not the glorious, rosy picture, takes me back to my 1st point! Well i’m going to pick my car up today at their vending machine here in Houston, TX. I cant wait everything has gone smooth so far, I will come back here and post my experience once I get the car, so far I am very optimistic. Where are you reading the positive reviews from? The reviews I read that are from every site other than Carvana are largely negative. I was interested in buying a vehicle from them until I read so many negative experiences. Maybe they survive and get it together, I like the promise of the service. I haven’t gotten around to posting a review but I bought my most recent vehicle from Carvana in June and I would also rate them an A for price, convenience, and selection. I figured out what couple models I was interested in and Carvana had better selection (and price) for the mileage and condition I was looking for, without the worries of a private sale. You may be able to get a better deal through a private seller especially if you are willing to drive a long distance but for me Carvana was perfect. I’m looking into buying my first car and the carvana no-hassle model with a return policy is very attractive to me. I think their pricing is kind of ho-hum though. Like, I just want a basic car, a late model Toyota Corolla. The carvana price is very, very slightly cheaper than the sticker of a certified pre-owned, same year Corolla from my local dealership with roughly the same miles. The price difference is so slight, even the most timid haggler could probably get it matched. I don’t get the Toyota CPO warranty, and the Carvana models are previous rentals vs. private owners at the dealership. I really want to buy a car from Carvana, I just can’t find a reason other than the return policy and not having to deal with a greasy car salesman. Thanks for the thoughts Roy. I’m sure you might be able to find something equivalent/cheaper at a dealership in some instances. I don’t discount the hassle factor though. It can take hours at a dealership haggling over price and getting all the paperwork signed. I hate going through all that mess. It’s like it’s me against the dealership/manager in the backroom. DON’T BE FOOLED!! THE PROCESS IS AWESOME!! CAR-1…..AWESOME EXPERIENCE (RANGE ROVER SPORT)…….CAR-2(BMW-740LI)….HORRIBLE EXPERIENCE….CALLED AND ADVISED THAT THE CAR HAD A SHAKE AND THEN WHEN I FINALLY WAS ABLE TO GET IT INTO BMW, BMW ADVISES THAT THE RIM HAS A HOLE IN IT….CARVANA RESPONSE: WELL YOU WILL HAVE TO PAY FOR IT BECAUSE YOU ARE OUTSIDE OF THE WARRANTY….MY RESPONSE: “ARE YOU KIDDING ME! !” AND OFF TO SOCIAL MEDIA I GO TO TELL ABOUT MY EXPERIENCE….8 HOURS LATER-CARVANA RESPONDS…”WE WILL TAKE CARE OF IT, OH WE ARE SO SORRY…BLAH-BLAH-BLAH……”…..A WEEK AGO TODAY, I TRADE BMW 740LI IN FOR INFINITI QX56….I DRIVE FROM VENDING MACHINE TO OFFICE…..I PARK…I DO NOT GET BACK IN TRUCK UNTIL 5PM…I GET IN, AND TURN AIR ON, IT ONLY BLOWS WARM AIR………I CALL CARVANA AND TELL THEM…THEY SAY, TAKE IT TO A REPAIR SHOP….I TAKE IT TO NALLEY INFINITI OF DECATUR AND I AM TOLD THE AIR COMPRESSOR IS GONE OUT…..HOW IN THE HECK DID CARVANA EVEN SELL A $45000 CAR WITH NO AIR?????????? WHO IN THE HECK INSPECTED THESE CARS BEFORE BRINGING THEM ONLINE TO SELL?? NALLEY REPSONSE; ” AIR COMPRESSOR IS ON BACK ORDER AND WE HAVE NO IDEA WHEN IT WILL ARRIVE….HOWEVER, A INFINTI DEALERSHIP IN HOUSTON TX AND ONE IN OKLAHOMA CITY HAS THE PART…HOWEVER, WE CAN NOT GET IT FROM THEM BECAUSE ITS A WARRANTY REPAIR…..CARVANA RESPONSE: ” OH WELL!”……YET, CARVANA SELLS A LEMON, ADVERTISES THAT I HAVE A WARRANTY, BUT REFUSES TO ASSIST ME IN GETTING CAR REPAIRED…..GUESS WHAT, I HAVE TO PAY $1200 FOR PART IN ORDER TO GET CAR REPAIRED…….CARVANA RESPONSE……”NOTHING!! NOT EVEN, WE WILL TAKE CARE OF THIS AND REFUND YOUR MONEY BECAUSE WE DROPPED THE BALL FOR SELLING THIS CAR…..” HORRIBLE, HORRIBLE, HORRIBLE!!!! “….CAR-2(BMW-740LI)….HORRIBLE EXPERIENCE…” Everything you say and every decision you made from this point on makes no sense. They have a 7-day money back guarantee. So take the car back if it has that much trouble and wait to get something else. They are not going to void their warranty and deny you the option to return the car. That would be worse press than the review you wrote here. Sandy, I’m not sure you realize that most people will bypass your message when you choose to use all caps. If you want people to take your “review” or experience(s) seriously you will need to speak/type as though you are able to relate to the public. Otherwise you come off as very emotional and maybe even delusional. Now as for your actual review I too wonder why you didn’t use their 7 day money back guarantee? Love what you’re doing keep up the great work. This is definitely a great read! The model is interesting. There are a couple of companies that offer great selections and ship nationally – one is vroom.com that has free national shipping and great prices. the other one is texas direct. there are new players in this market. finally! Carvana seems to be really good means to buy a car, Brian. I haven’t bought a used car before maybe I will when a need comes up. Thanks for the review Brian. Jayson recently posted…My Health Is A Priority – Is Yours? Brian, this is pretty incredible! I haven’t heard of Carvana, most likely because I live in Minnesota. Somehow I missed their Super Bowl ad, too. This is an incredibly appealing process for me because I do 99% of the work before I even step on the lot. My past two cars were found online after hours (and days) of searching and the test drive was basically a formality. If they start operating in the Midwest I will definitely check them out! Sounds very intriguing, Brian, and I’m glad you had such a positive experience. Selling (and buying) cars can be such a stressful experience and anything that makes it simple and pain free is a big win in my book! I think this sounds fascinating. I have never purchased a used car, and I always fear what you will find lurking underneath the hood after you get it, but with the guarantee, though, it makes the experience more appealing. The guarantee and the thoroughness of their inspection process has me sold. Plus their inventory is focused on newer models so the chances of significant mechanical issues are minimized.